Believe it or not, we have award winning coastlines. St Ives in Cornwall has fresh air and a sparkling sea and not far away in Bournemouth, you’ll find 7 miles of super sand and some of the warmest water temperatures anywhere on the coast in the UK. Wales gives us Pembrokeshire and the iconic Tenby beach front. You’ll discover over a mile of sand dunes and plenty of family activities for everyone. 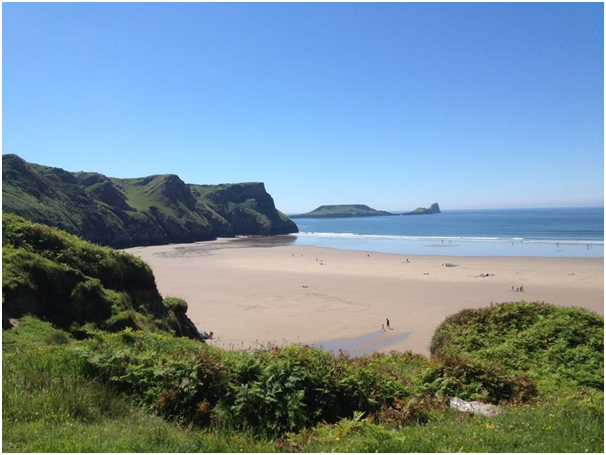 Try the south too for Rhossili Bay on the Gower Peninsula, a seriously good award-winning beach for beach-goers and surfers. A national tradition and treasure, no trip to the seaside is complete without the obligatory bag of fish and chips. Britain does it the best – moist, flaky fish with hot, salty chunky chips! If you can keep the seagulls at bay, then enjoy! As well as all the nations wonderful tourist attractions, you’ll always find a bit of the weird and wonderful in seaside towns too. The joy is finding these quirky sights, such as the Shell Grotto in Margate – a 70-foot tunnel bedecked with over 4 million shells in mosaics, patterns and symbols! It was unearthed in 1835 but nobody knows its origins. The seaside is also the place to go for theatres, galleries and museums, so you can fill your boots with culture as well as sand. Experience the open-air auditorium at Porthcurno, Cornwall for example, where dramas, comedies, musicals and shows are performed throughout the summer. Crosby Beach in Merseyside is home to 10 cast-iron figures found amongst the sand dunes that gaze out to sea and become submerged when the tide comes in. Llandudno is home to a theatre with a vast entertainment programme and you’ll find the Turner Contemporary art gallery in Margate. The seaside is definitely not just ice-cream and arcades, you’ll find plenty of cultural pursuits too. Gone are the days when the only choice by the sea was a B&B. The UK now boasts some fantastic accommodation to suit every budget and family size. Splash out on a 5-star country house break, book a private self-catered cottage, choose a trusted hotel chain, find a budget B&B or go glamping in a shepherd’s hut or yurt. There is something for everyone nowadays, whether you want the ease and convenience of a caravan site with entertainment or a private retreat in the forest.